A few years ago I wrote about a curious and very specific relationship between some beetles and their wood-eating fungus symbiotic partner, and we’ve also shared other work on crazy parasitic creatures that can alter their hosts’ behavior, sometimes pretty radically (warning, creepy video). Believe it or not, the photo above isn’t some weirdly-antlered African ant–well, actually it is, but the antlers aren’t part of the ant’s body, they’re the spore-spreading apparatus of a parasitic fungus. Read on for more about the real-life World War Z that has been going on between ants (as well as other insects) and a family of zombifying fungi for millennia. Earlier this week I went to a lecture hosted by Cornell’s Department of Neurobiology and Behavior titled “Zombie Ants: the precise manipulation of animal behavior by a fungal parasite.” The lecturer was David Hughes, Professor of Entomology at Penn State University, whose faculty webpage provides PDF links to most of the articles that he has contributed to if you’re interested in checking out the actual journal pieces on this topic. Professor Hughes studies the parasitic fungus Ophiocordyceps unilateralis (although he and his collaborators have also identified several other species in recent years, since a high level of specialization is required to both infect and affect different species of ants). He and his team analyze the fungi’s relationships with different types of carpenter ant in the forests of Thailand, Brazil, Australia, and the US (South Carolina). Essentially, what happens is a worker ant comes into contact with a spore of the Cordyceps fungus, which through a combination of enzymes and mechanical pressure forces itself through the insect’s cuticle and then grows throughout the body cavity, taking control of the head and changing the ant’s behavior. 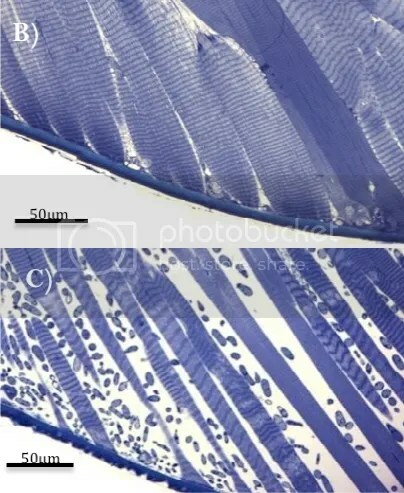 B) is a light micrograph (LM) of healthy muscle and C) is a LM of muscle from a behaviorally manipulated ant that was biting a leaf and alive when removed for fixation. The small blobs between the fibers are fungal cells. 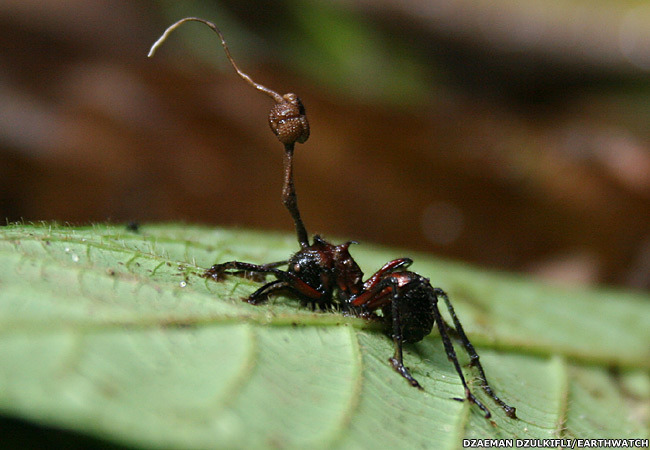 Since the ant’s body becomes the radiating point for more parasitic spores to be spread from, the bizarre antlers on the African ant shown above make more sense: the fungus is trying to increase the range of potential infection. In fact, I wouldn’t be surprised if the photo had been rotated for visual purposes (as in the second photo from the top by Dzaeman), because quite a few of the ant species are directed by their zombifying parasites to cling to the underside of the leaf or twig, probably to both avoid the ant getting eaten by predators and to help spread the spores–many of the spores would just fall on the leaf if the ant were on top of it rather than below. Apart from the fantastic images from the video above, you might also want to explore a slideshow of photos from LiveScience, and if you’re itching for more videos, here’s a TED Talk by mycologist Paul Stamets, who mentions the pest-control possibilities of fungi in his six ways to save the world with mushrooms. But don’t let me tell you what to do. And don’t go near any tree-huggers with something sprouting from their necks.